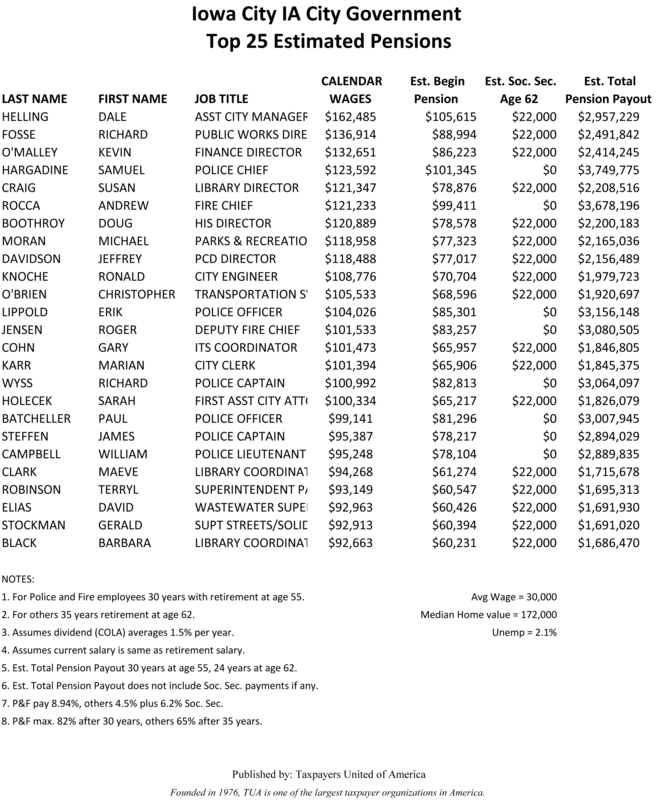 CEDAR RAPIDS—A report released today by Taxpayers United of America (TUA) reveals salaries and top pension estimates for the government employees of the cities of Cedar Rapids and Iowa City, Linn and Johnson Counties, and area government teachers. These government employees are not only receiving generous salaries, but as retirees, many will become pension millionaires. Iowa bureaucrats refuse to release pension figures, so total pension payouts were estimated* for this report. DES MOINES—A report released today by Taxpayers United of America (TUA) reveals salaries and top pension estimates for the government employees of the cities of Des Moines, Ames, Boone; the counties of Polk and Story, Iowa government teachers, as well as Iowa State employees. These government employees are not only receiving generous salaries, but as retirees, many will become pension millionaires. Iowa bureaucrats refuse to release pension figures, so total pension payouts were estimated* for this report.